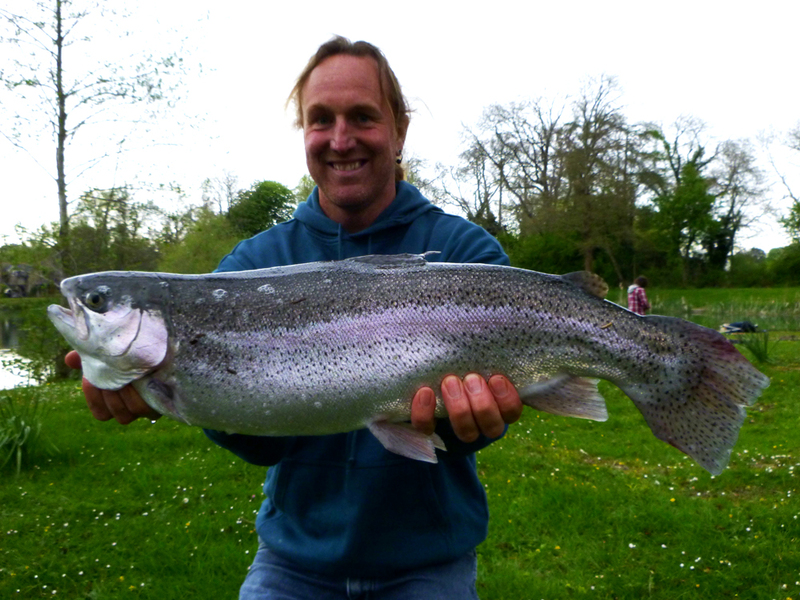 A trip to Lechlade, home of monster trout, in search of a PB with Steve and Dylan - the target was a double. And we'd managed to find less than ideal conditions; wind, rain and worst of all a daphnia bloom - that was keeping the trout more than busy. Dylan and Steve started out working nymphs and lures while I wandered about trying to spot a fish in the margins, spotting and bumping two fish, it was looking good - but then the fish stopped moving and disappeared from view. 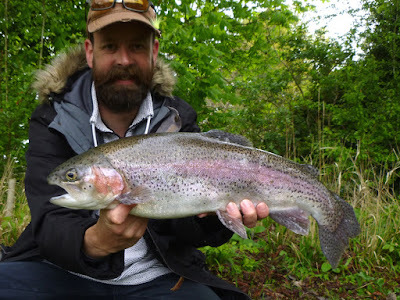 Just before lunch I spotted a solo rainbow feeding under a overhanging tree, it nailed an orange nymph and after a lacklustre fight the first fish was in the net, a 5lb 3oz new PB rainbow trout - a great start but I knew there was bigger to be caught. Had they switched back on? We thrashed the water to a foam for the next six hours for just a couple of follows, this was hard work. Eventually Dylan started to get interest in a white lure, before our target nailed it - a good double figure rainbow charged off - unfortunately jumping and landing back on the line, it was gone. We all switched to white lures and the trout started to show interest - Steve nailing the fish above, after a cracking fight his new PB of 9lb 0oz was in the net. Nice one Steve! Then they disappeared. A walk around the lake produced my chance, the biggest fish I'd seen all day nailed my lure - but unfortunately it wasn't to be, shedding the hook after a few powerful runs... Ah well, next time!